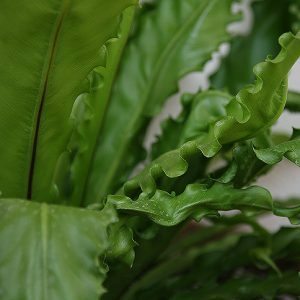 Commonly called the Ruffled Birds Nest Fern, Asplenium antiquum Victoria is one of the most impressive of all the ferns. Very popular as an indoor feature plant where it seems to thrive. Best described as an intriguing and dramatic feature plant, it is the heavily ruffled margins of the foliage that give this fern its Wow factor. This is a fern that forms a neat rosette of foliage, mid to deep green in colour and very attractive grown in a container or in the garden. As the plant matures the foliage broadens retaining the wavy or rippled leaf margins. 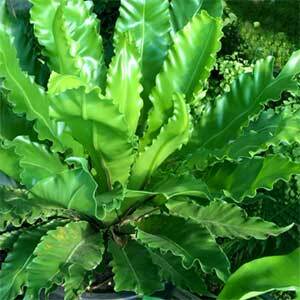 Well suited to growing as an indoor plant, it requires less watering than most other indoor ferns. It is a plant that grows in deep shade, which makes it an excellent indoor specimen plant. It is easy care as long as it is not in direct sunlight, and receives regular watering, usually once every 3 – 7 days. Best watered in the morning, as this allows the potting soil to dry before the cool of the evening. A slow release fertiliser applies at 30% of the recommended rate in early spring and again in late summer will be sufficient. Fertiliser needs to be applied to the soil, and should not touch the foliage. Water before and after fertilising. Ensure that you are using a free draining potting mix. Drainage in the pot should also be good, look for a pot with multiple drainage holes. Watering during winter should be reduced to once every 14 days. Origins – Australia – East Coast rainforest. Position – Part shade to dappled or filtered light. Soil – A well drained soil is essential. Frost tolerant – No . Drought tolerant – No, however will recover from dry periods.